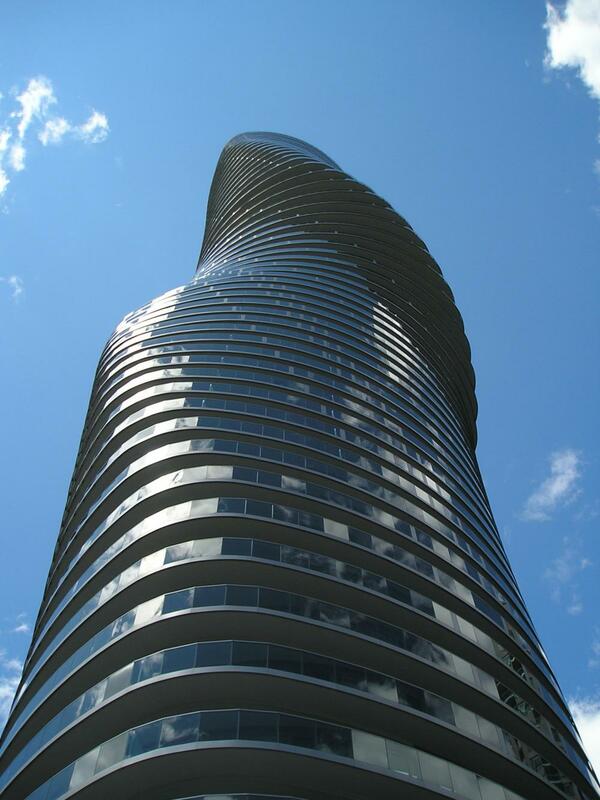 Two of the most sought-after condos for sale in Mississauga, the Absolute Marilyn Monroe condos are the fourth and fifth towers in the Absolute development at Mississauga Square One. These incredible twisting towers were the result of an international design competition which was won by Yansong Ma of MAD architects, based in Beijing, China. 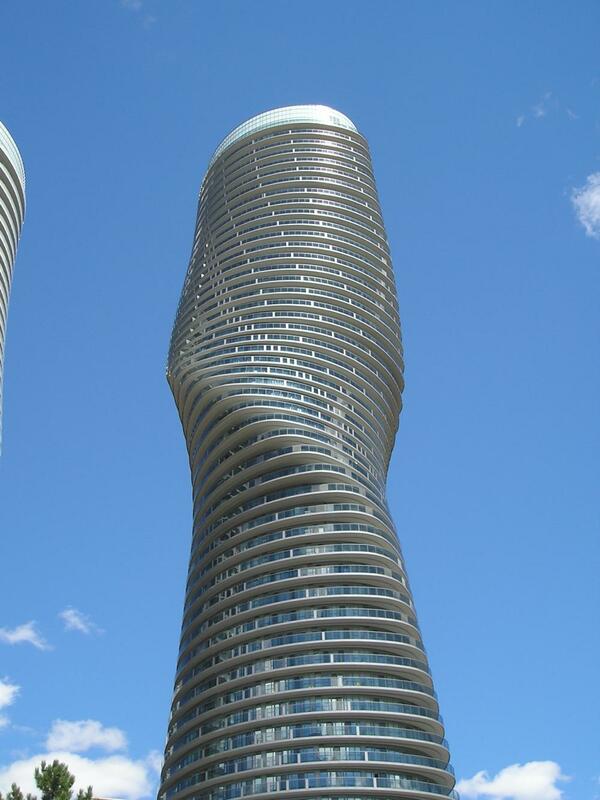 The local developers, Fernbrook/Cityzen, went on to build and complete the distinctive towers, which have since won international accolades, and Absolute World, which quickly acquired the nickname “Marilyn” due to its organic curves, has become a symbol of the City of Mississauga. Built and completed in 2011. the “Marilyn Monroe” condominium has a unique, instantly identifiable look that is visible for miles around. Located just across the street from the Square One shopping mall, Ontario’s largest mall, 60 Absolute consists of a single 56 storey point tower which is complimented by a 50 storey sister tower at 50 Absolute Ave. There are also podiums on the west and south sides, containing garden apartments and retail. Municipal address for the Absolute “Marilyn Monroe” condos is 50 and 60 Absolute Ave.
Absolute condos, aka the Marilyn Monroe condos, are perhaps the most distinctive towers in the recent wave of luxury condos which have been built in the Mississauga City Centre (MCC) area, and like the others it is conveniently close to all that MCC has to offer: Square One Shopping mall, with its 360 shops, restaurants, and services, is about a 3 minute walk away, with the southeast entrance to the mall (Walmart) closest. In addition, Celebration Square with its nonstop cultural events, fountains, and skating rink in winter, Mississauga City Hall, the central YMCA, the central library, Sheridan College, the Living Arts Centre, and the Mississauga Transit and GO bus terminal are all within easy walking distance. Absolute condos are also within walking distance of the Cooksville GO station, as well as schools such as Father Goetz Catholic Secondary School, and T.L. Kennedy Public Secondary School. Access to the 403 highway is a couple of minutes away, and residents will find close proximity to a number of major grocery stores such as the Metro located nearby on Mississauga Valley Blvd., the Whole Foods recently opened on the north side of the mall, and the full grocery located in Walmart at Square One. Marilyn shares an elaborate 30,000 square foot recreational facility with its sister towers. The various amenities are located primarily in an area known as “Absolute Club”, and Absolute features a long list of facilities for residents and their guests – including guest suites, meeting rooms, and business centre. The Absolute Club also features indoor and outdoor swimming pools, whirlpool, spa, exercise room, and a two-storey gym with squash, racquetball, and basketball courts. 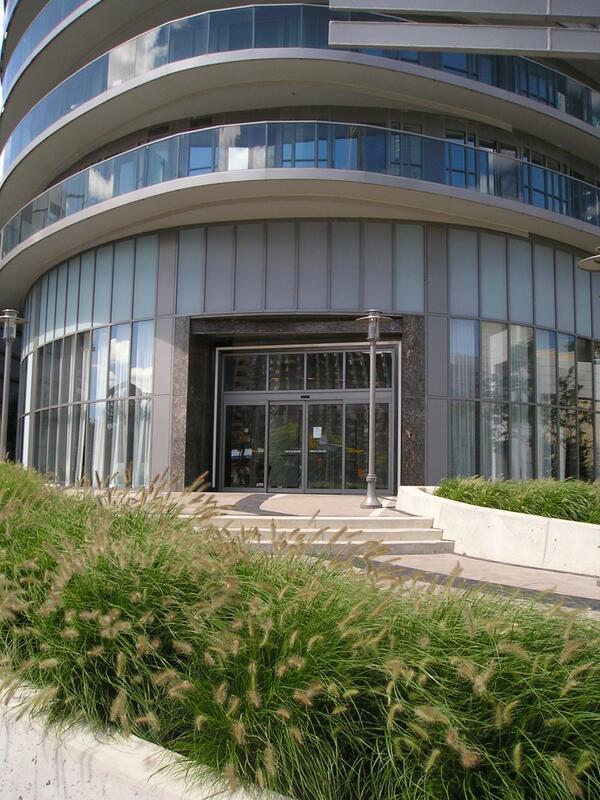 As a Mississauga condo, Absolute is conveniently located near several city parks. including Kariya Park, which was originally a gift to the city of Mississauga from the city of Kariya, Japan. This renowned park area, with its serene pond and Japanese gardens, is often the setting for wedding pictures for newlywed couples. Across Burnhamthorpe Road, a nearby ravine provides access to Mississauga Valley park, which features baseball and soccer fields, extensive BBQ areas, forested creek with plenty of wildfowl, and water splash pads for children. The Absolute condos feature extensively landscaped courtyards, with seating areas and walking paths. Throughout the 2 condo towers, individual units have massive open wraparound balconies, many with impressive views of downtown Mississauga, Toronto, and distant points such as Niagara Falls. There are luxury penthouses in the towers which rival anything, anywhere.